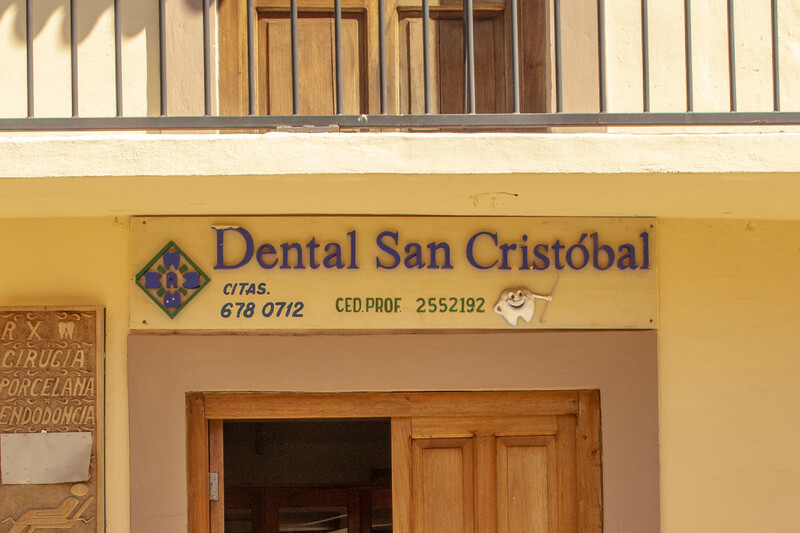 The night we “officially” relocated to San Cristobal de las Casas in Chiapas, Mexico my wife lost a pretty major filling and needed to find a dentist. She wasn’t in any sort of pain and it wasn’t an emergency but it was something that needed to be taken care of and of course, we didn’t want to wait too long to address it. It was around 7 PM I asked a friend of mine if he knew of any local dentists that could see us on short notice and he recommended Doctor Mario Flores at Dental San Cristóbal. He told us his office is near our home right on the Andador (main walking area) and we should go see him. I said thanks and we will get up and go in the morning. He told us we could go right then; he has his office hours in the evening. So we left and after a ten-minute walk, we found the office exactly as he told us – directly across from Anabananna – and went inside. The waiting area was a bit aged but clean and serviceable. We talked to the receptionist and she asked us if it was an emergency. My wife explained that it wasn’t but she would like to take care of it soon. She gave her an appointment for 7 PM the next night and we left to go out and enjoy a crisp cool night in San Cristobal. The next night we arrived about ten minutes early and after a short wait, she was shown into the office. The dentist was a personable man who spoke perfect English and asked what the problem was. My wife explained what had happened with the filling and after a quick examination, he said told he could fix it right away and gave her the cost up front: 500 pesos (about $37 USD). The office was clean, seemed to have all the latest equipment and after 15 minutes or so she had a new filling. The dentist politely scolded her for brushing too hard and suggested she go out and get a new toothbrush with softer bristles. We paid. We left. We went to a nearby pharmacy and got a new toothbrush. We were home in less than an hour. Going to a dentist in Mexico proved to be more convenient and much cheaper. Now I don’t know what the same thing would have cost in the United States but I am sure the cost would have been substantially more. I am also pretty sure it would have been a bit tough to get a next day appointment as a new patient with a new dentist. I am also pretty sure the odds would be slim for getting a 7 PM appointment. Once again we have had another no muss on fuss experience with the Mexican medical establishment and it has been nothing but positive for us, but you should do you own homework too. That’s great that you went to such a good dentist in Mexico. It’s nice that healthcare can be so much less expensive outside of the US!